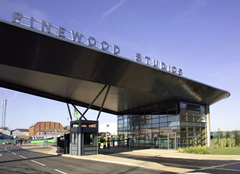 We are located at the world famous Pinewood Studios in Iver Heath, Buckinghamshire, UK. Pinewood is easiliy accessible from the A412 between Denham and Slough. Click here for a map of our location or for details directions from any location, use the RAC route planner. We are located in Shed 14 at Pinewood, close to the 2 TV Studios. Click here to view our location on the Pinewood site map.